Tilt the monitor back or forward, and adjust the height up or down to use mezzo in a variety of settings whether standing or sitting in front of the screen. You can even turn the monitor 90° to change your viewing mode from landscape to portrait to read a longer column in a newspaper, magazine or column of numbers. mezzo‘s camera is conveniently positioned for writing comfort as well. 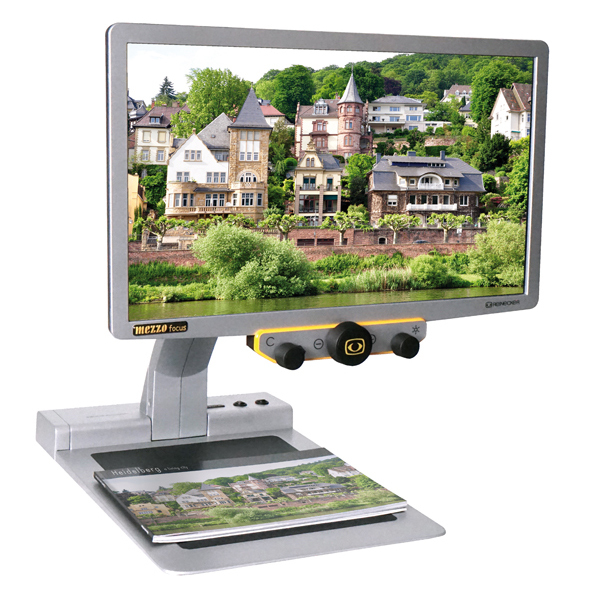 Use it to sign a check, address an envelope or fill out a form with this attractive, low-profile transportable desktop video magnifier. * Optional X/Y table and mobility pack (battery and carrying case) sold separately. * Two-years limited parts and labor warranty. NELE technology to reduce glare on glossy materials and reduce shadows while writing.